Morses Club provides cash loans to our customers who are based all over the UK. With a short online application form and all circumstances considered, our loans make borrowing and repaying cash simple and straightforward. Find out if you could qualify with a quick call or apply online. Either way, you'll get a decision in principle on your loan application within minutes. 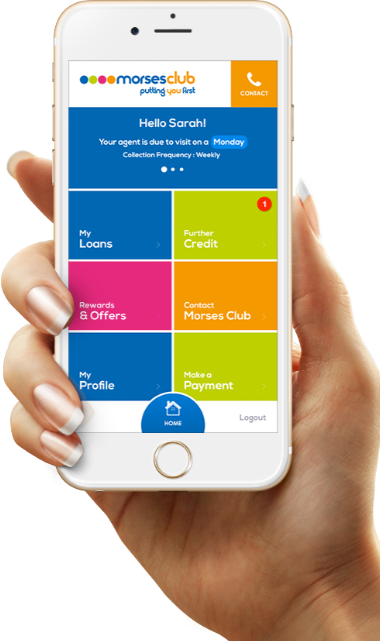 Morses Club offers personal home collection loans of up to £1500. So if you are looking for some extra money for home repairs, fixing your car or other unexpected expenses Morses Club could be able to help. We are a responsible lender who will only lend what you can afford to repay to avoid unnecessary debt. Even if you have bad credit like mortgage arrears or CCJs, every application will be considered. * Once your loan application is accepted in principle you will receive a call from a member of your local Morses Club team – we aim to contact you within a few days. They'll arrange for an agent to call round to finalise your loan and complete affordability checks, we do these every time – whether you’re applying for £100 or £1000. New customers are eligible for up to £400, while existing customers may be able to borrow more. Our interest rate is fixed so you'll know upfront how much our cash loans will cost. There are no hidden fees and charges so you'll know exactly what you're paying back each week. To make it even easier, a friendly Morses Club agent will deliver your money to your home. They will also collect your repayments from your home each week at an arranged time. Apply online for a convenient cash loans from Morses Club.